Star Formation Galaxy - Universe Galaxies And Stars Section. Star Formation in Nearby Galaxy. star birth in a neighboring Galaxy. The image illustrates a perfect case of sequential star formation in a nearby Galaxy where new star birth is being triggered by previous-generation massive stars. A collection of blue- and white-colored stars near the left of the image are among the most massive stars known anywhere in the universe. The region around the cluster of hot stars in the image is relatively clear of gas, because the stellar winds and radiation from the stars have pushed the gas away. When this gas collides with and compresses surrounding dense clouds, the clouds can collapse under their own gravity and start to form new stars. The cluster of new stars in N11B may have been formed this way, as it is located on the rim of the large, central interstellar bubble of the N11 complex. 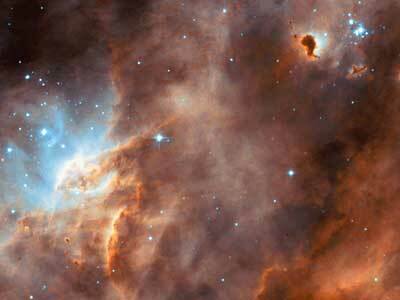 The stars in N11B are now beginning to clear away their natal cloud, and are carving new bubbles in turn. Yet another new generation of stars is now being born in N11B, inside the dark dust clouds in the center and right-hand side of the Hubble image. This chain of consecutive star birth episodes has been seen in more distant galaxies, but it is shown very clearly in this new Hubble image. Farther to the right of the image, along the top edge, are several smaller dark clouds of interstellar dust with odd and intriguing shapes. They are seen silhouetted against the glowing interstellar gas. Several of these dark clouds are bright-rimmed because they are illuminated and are being evaporated by radiation from neighboring hot stars. This image was taken with Hubble's Wide Field Planetary Camera 2 using filters that isolate light emitted by Hydrogen and oxygen gas. The science team, led by Astronomers You-Hua Chu (University of Illinois) and Yäel Nazé (Universite de Liège, Belgium) are comparing these images of N11B, taken in 1999, with similar regions elsewhere in the LMC. This color composite image was co-produced and is being co-released by the Hubble Heritage Team (STScI) and the Hubble European Space Agency Information Center (HEIC).